Most of us genealogists have wished one time or another that we could really “know” how our ancestors lived. We want to know what their world was like. What was a typical day like in the life of our ancestor? How did our ancestors handle life’s challenges? In other words, we wish we could walk in their shoes. 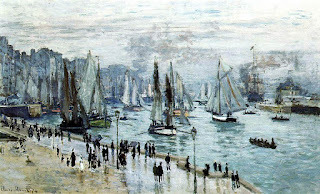 For many of us one of the most fascinating times of our ancestors’ lives is when they emigrated from their homelands. What made them leave? How did they feel about leaving? What was the journey to America like for them? Where did they first settle in America? 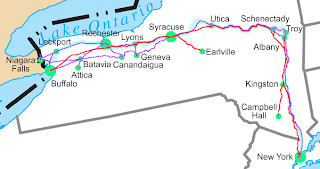 I stumbled across a travel diary written in 1833 that gave me the opportunity to follow the journey of a party of Swiss German emigrants through France to the port of Le Havre, across the Atlantic Ocean, across the eastern part of the US on the Erie Canal and down the Mississippi River to St. Louis. How did I find this wonderful piece of history? 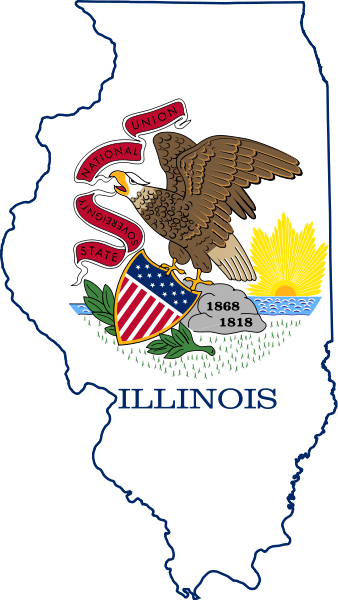 I had been preparing for a research trip to Chicago for several months. I described this preparation in my posts of June 24, 2012, July 4, 2012, and August 21, 2012. I learned from reading genealogical how-to books how important it is to prepare for a research trip by studying the websites of the sites you plan to visit. When I looked up the Newberry Library website, I found there is an on-line catalog that you can use from home to search for materials. Many libraries and archives have this feature, so it is a good idea to check out the availability of catalog searching at home no matter your research destination. This could you save valuable on-the-ground research time. On the first day of my two-day sojourn at the Newberry, I went to the second floor and filled out a research request form for the diary. 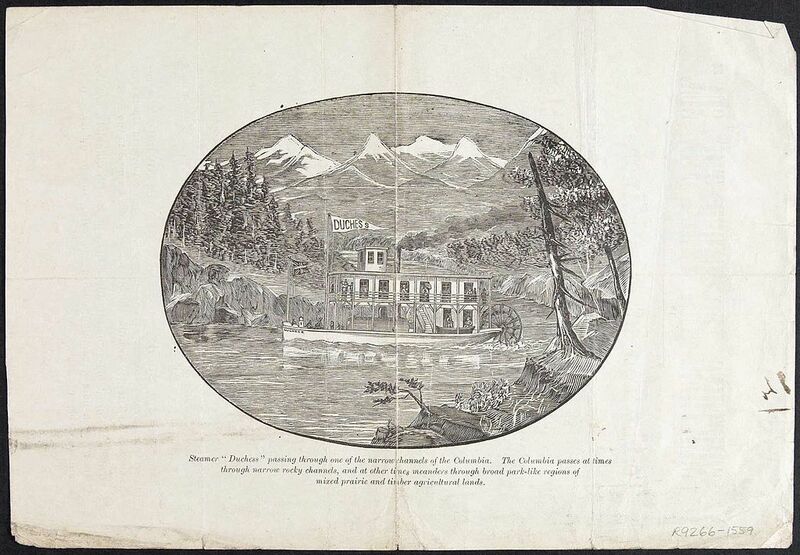 The document was written in 1833 by Joseph Suppiger, Jr., a nephew of Dr. Kaspar Koepfli, who was the leader of the group who were heading to America. Before a big move, people tend to get rid of extra furniture, large pieces that would cost too much to ship or transport. Sometimes under the pressure of moving deadlines, people are forced to part with possessions for much less than they think they are worth. I felt so privileged to travel with Mr. Suppiger across France to the port of Havre, to see with his eyes what the country was like and to watch the leaders in his group negotiate with wagon drivers and inn keepers on the road to the port city. 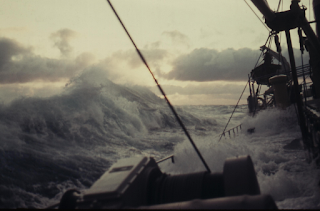 Then Mr. Suppiger introduces his reader to the perils of seeking a seaworthy boat in which to cross the Atlantic. And that is no easy task. It seems that even back then, people tried to cheat travelers out of their money through scams ranging from taking deposits on ships that never showed up or that were in such poor condition that no person in his/her right mind would trust them to cross the ocean to promising stellar accommodations and delivering standing room only on the deck, if you were lucky. And how many of us long to know what the ocean voyage to America was like for our ancestors? Mr. Suppiger keeps us so well informed of the weather conditions, the food, the scenery, and the types of accommodations suffered by passengers that we feel we are right there with them. 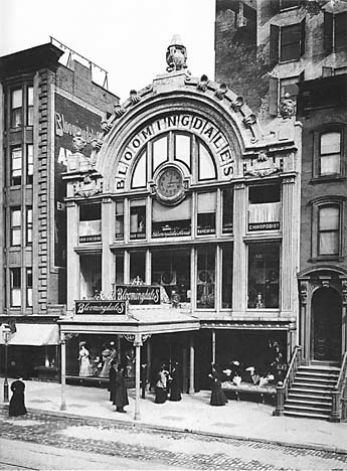 Below we see an example of 19th century New York department store architecture, albeit some years after Mr. Suppiger's visit, in this photo of Bloomingdales, a company that was started in 1860 by two brothers named Lyman and Joseph Bloomingdale. 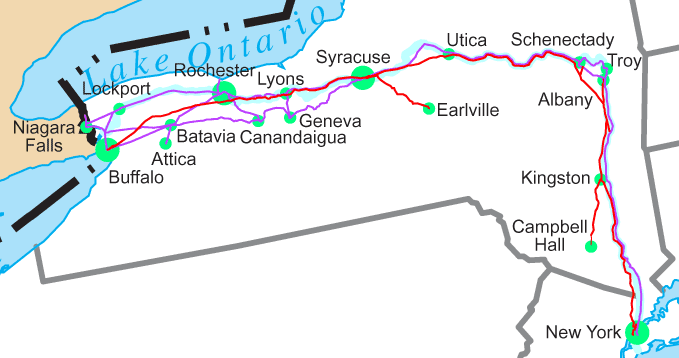 The next part of the diary takes us up the Erie Canal, from Albany to Buffalo, and what a journey it is! 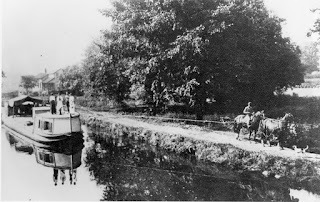 We have the rare opportunity to see America the way it looked in the early 1800s as Mr. Suppiger describes the land that he sees as the boat goes up the canal. At the end of the canal in Buffalo, the group engages a steamboat for the trip down the Mississippi to St. Louis when the diary ends. 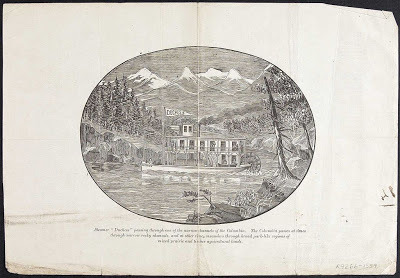 In order to provide the reader with an idea of what the new world was like to these Swiss emigrants, the editor, John C. Abbott, included portions of two more documents written by other members of the group. First, we need to clarify that Dr. Kaspar Koepfli and his party did not purchase land in St. Louis or any other place in Missouri for a couple of reasons; one being that they found no parcel that had sufficient cleared land ready for farming. And second, they did not want to settle in a state that allowed slavery. One of the most valuable parts of the diary and the accompanying descriptions of New Switzerland are the notes to those who follow. Here Mr. Suppiger and members of the Koepfli family offer their advice to perspective emigrants. It is so like a Frommers Guide that I wonder once more, is there anything new under the sun? So ends the journey to New Switzerland. I hope that you can find this book and get a glimpse into 19th century America.